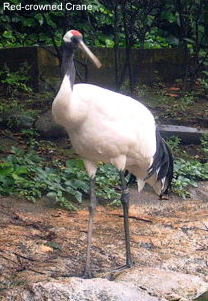 The Red-crowned Crane (Grus japonensis), also called the Japanese Crane and Manchurian Crane, is a large crane and is the second rarest crane in the world. In South East Asia, it is known as a symbol of luck and fidelity. At 55 inches high, the crane does not make easy prey, for all that it stands out in its natural habitat of marshes and swamps. 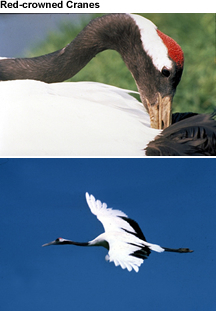 When it matures, the Red-crowned Crane is snow white with a patch of red skin on its head. This patch of skin becomes bright red when the crane becomes angry or excited. An exceptional male weighed 15 kg (33 lbs. ), making this the heaviest crane on record, although large Sarus Crane are taller. 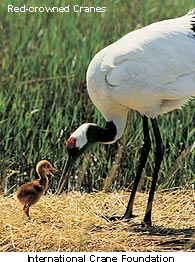 In the spring and summer, the Red-crowned Crane lives in Siberia, where their eggs hatch. Normally the crane lays 2 eggs, with only one surviving. Later, in the fall, it migrates in flocks to Korea, China, and other countries in SE Asia to spend the winter. All Red-crowned Cranes migrate, except for a flock that stays in Hokkaido, Japan year long. Habitat: Marshes, river banks, rice fields, and any place with water, standing dead vegetation, and food. The crane eats small amphibians, aquatic invertebrates, insects, and plants that grow in marshes and swamps.